Well, I'm back from my summer hiatus. I know you all missed me. It is rather remarkable how well the linear trend fits the historical data despite the significant demographic changes that have occurred over this sample period. But, there you have it. Of course, as the great Eugen Slutsky pointed out, the interaction of chance events could generate periodicity where none actually exists, see: The Summation of Random Causes as the Source of Cyclic Processes. 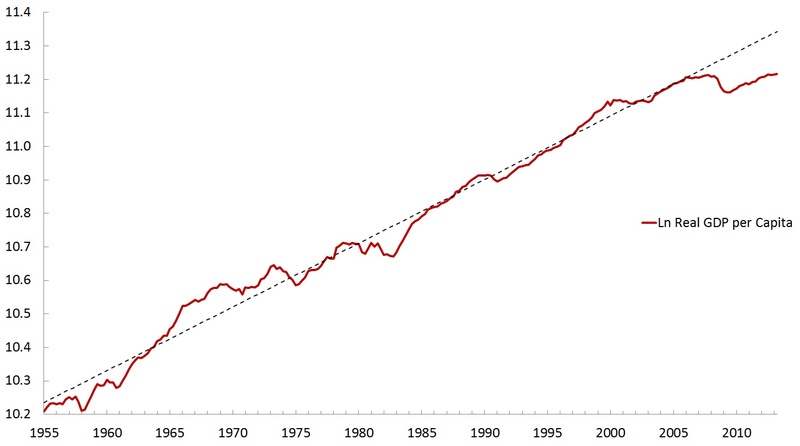 In layman's terms: that linear trend you seen drawn through the data above might just be a figment of your imagination. 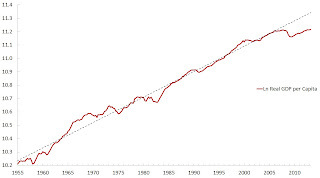 So we should always be careful when interpreting deviations from statistical trend. Having said that, there is something rather odd about the recent recovery dynamic. In the U.S., the business cycle is mostly about investment spending. 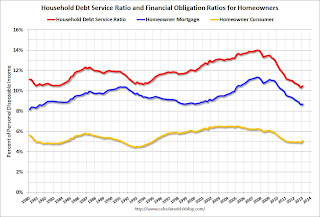 Consumer spending (non-durables and services) is relatively stable. 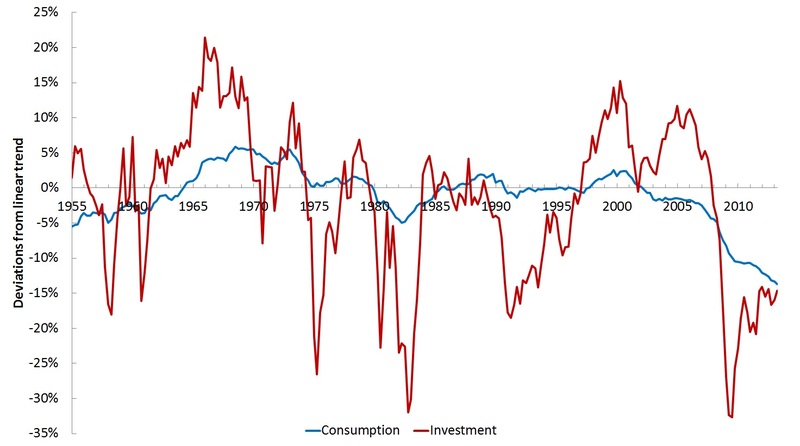 And in the typical recovery dynamic, consumption and investment tend to move together (this applies to booms as well). The following figure plots (detrended) real per capita consumption (non-durables and services) and investment (includes consumer durables). With the onset of the 2008 recession, we see the sharp drop in consumption and the even sharper drop in investment. The decline in both series initially was not unusual--apart from the severity of the shock. 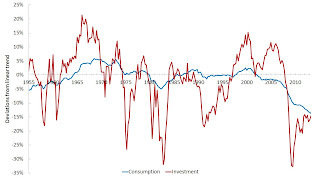 What is unusual is the subsequent recovery dynamic: consumption and investment appear to be heading in different directions, relative to their historical trends. Here's the same data, except with investment decomposed into residential and non-residential investment. So, residential investment behaves largely like other forms of investment, except that it is considerably more volatile. 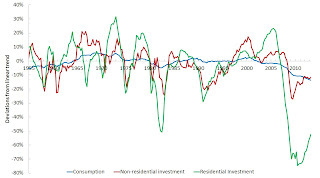 In particular, the recovery dynamic for residential investment looks like what one might expect, given the large negative shock in that sector. And yet consumer spending continues to fall away from its historical trend, even as residential investment recovers (albeit, slowly). Can someone point me to a theoretical model that generates this type of consumption-investment dynamic during a recovery? 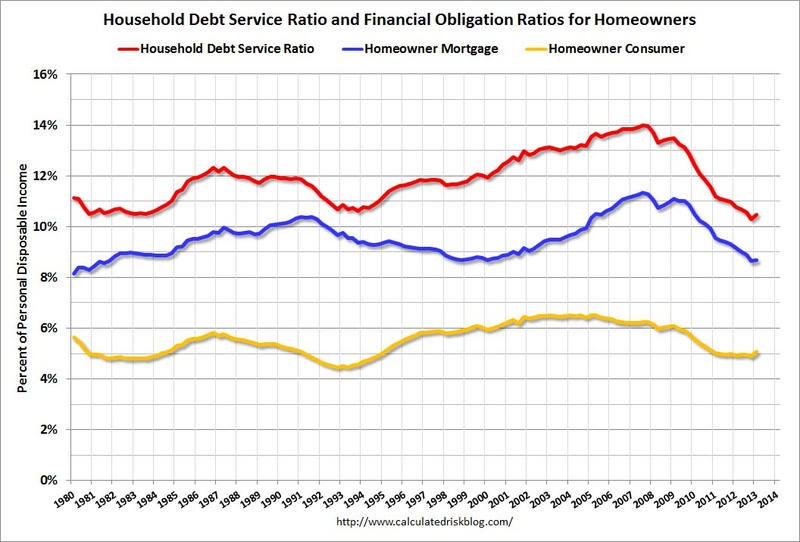 These debt-service ratios are now at or close to their historical lows. Is the consumer now ready for a major comeback?